Register Log In ECN Forum Forums General Discussion Area Repair or Installation? In another thread I've mentioned a panel change from an FPE to a GE. In this particular installation, the plumbers installed the water heater almost directly in front of the panel, enough to bust working clearances, but not enough to keep the door from being opened 90 degrees. This happened 22 years ago. I reiterate that the panel was there FIRST. Just where is the line for grandfathering -in old work? This house has no GFCI's and no dedicated 20A kitchen or bath circuits, etc. has 60C wire and a three-wire cable feeding the range. Where does it stop? Do I have to rewire the whole house for my original bid of $350??? A panel is usually installed well before a water heater in construction, so who is reponsible for busting the clearance code? That term "grandfathered" , or "existing" is used a lot. It's interpertation is as wide as the atlantic. Situations as bad as any in the photo's sections are given this label. Inasmuch as other trades know mine as much as i know thiers, i do not wish to be held accountable for thier interventions. Find yoursaelf another inspector. I think you live & work too far from me for me to help you. If your inspector cannot cite a specific reference, he may be blowing smoke. As far as grandfathering is concerned, if conditions have changed since the original installation (water heater conflict), bring it up to code. If it didn't meet code to begin with (sometimes hard to know what was in the NEC 30 or 40 years ago) bring it up to code. Basically, if it isn't safe, just being in place & in use is no excuse, bring it up to code. By the way, the inspection that is required by Allegheny Power ends at the service disconnect or the main disconnect inside a mobile or modular home or the sub panel in a stucture if the service disconnect is located outside. Anything inside the service panel is fair game, anything past it is off limits unless the homeowner is paying the inspector to look at the entire installation. Your inspector has no authority to require upgrades on any of the items you mentioned. So, is there a 5 foot clearance rule for water heaters? (Please give me the article # if there is...) This would mean the panel or the water heater would have to be moved to a different room, there is no place in the utility room that is 5 ft. away. The lack of GFCI's, and other problems aren't really an issue (yet) although I intend to suggest many improvements. Tom, is the working clearance part considered beyond the authority of Allegheny Power, or were you referring to the lack of GFCI's, etc.? My main concern, not really an issue here, is the situation where an unsafe condition is ignored by the customer due to roadblocks created by the code. It is my belief that the intention of the code is safety, and when a nitpicky or "minor" violation thwarts safety by financially overwhelming a potential customer to the point of declining the work, then the code has failed. I want to also point out that I'm not quick to avoid code, I prefer to do things right. But this has been a lesson to me especially if I become an inspector. 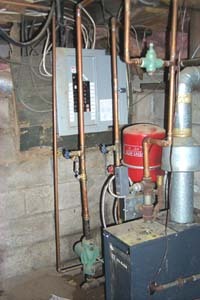 Unless it is in the plumbing code, there is no reason to keep the water heater 5 feet away. The working space is 30" wide (or width of equipment if wider) & 36" deep measured from the cover. The space does not have to be centered on the equipment. Moving it over one stud space is probably the solution. Working clearance at the panel is definitely part of the inspection & I personally enforce this one with no exceptions. We've all had to work on equipment that didn't have adequate space & I am not going to contribute to this particular problem When I get my current roll of film developed, I'll be submitting some working clearance violation pictures. As for the GFI's, they are not a part of the inspection procedure unless the person hiring the inspector is paying for a whole house inspection. If they are missing, this is probably a "grandfather" issue. I always recommend installation of GFI's because they are relatively cheap for the amount of protection. When I became an inspector, I promised myself I would not have any of the bad traits of inspectors I've dealt with. You'll never hear me say "the way I want this done" or "the way I do it", you get the drift. I'm sure I have my faults, but this isn't one of them. Also, if I can't find it in the code book, it's not a violation. I will cite article numbers to electricians, I try to give a plain English explanation to homeowner's. The flip side of what I say & don't say is that I hate to hear an electrician say "when did they change that?" Sometimes, it was never changed, it was wrong to begin with. Finally, if it is a small violation, not enough straps on the cable, etc, I'll ask that it be fixed & will pass the intallation with the expectation that it will be taken care of. If I have to turn down an installation, for a major violation, I will write up everything that is not in compliance, including all those little nit-picking details & it all must be fixed before I will pass the job. Well, thats enough of this screed. Good luck if you decide to take the test. I recommend you get ahold of the study guides. My question is... who is responsible (financially) for fixing it when the AHJ insists on it being done? I know of very few instances where a water heater, etc. is installed BEFORE a panel. Do you guys follow me on the timeline here? 4- Now sparky has to move the panel at his own expense? I'd gladly send the IAEI the bullets !